There are times in all of our lives, all of us must send a sympathy card. They are seldom joyous occasions. And unfortunately, often these sympathy card needs do not come with a lot of advance notice. So I always try to have several sympathy cards made in advance - just in case I need them. My hubby and I go to Florida every winter for a few weeks to escape the severe cold in our area. So I nearly always create several sympathy cards in advance to take with us. I have stamps and some supplies in Florida but not nearly as much as I have at home in my craft room. Of course, then there are those occasions when a special person in our lives passes away. Then I must create a very special sympathy card. One dear friend was a collector, seller, convention goer of model trains. Traveling to the west coast by train was on his "bucket list." And he, his wife, and one of their two sons just a few months before he was diagnosed with a terminal illness. So when he died, I had to use a old fashioned train stamp on the sympathy card for his wife and family -- of course. About a week or so ago, one of my dear friends passed away. She was 84. She was not just a dear friend, at one time she was also my boss. She was the principal at the school where I taught. She had a rare gift of not only being your boss but she was also your buddy and friend. She was the best principal I ever had. So I had to create a very special sympathy card for her hubby and family. She was the type of friend that you could see or talk to today, and then not again for a few months and your conversation would pick right up again. We shared recipes, prayer requests, interests in each other's children and grandchildren. I only knew one of her children and was acquainted with a few grandchildren, but she knew all of my children and was interested in my grandchildren. This is the card I created as our sympathy card for her husband and family. 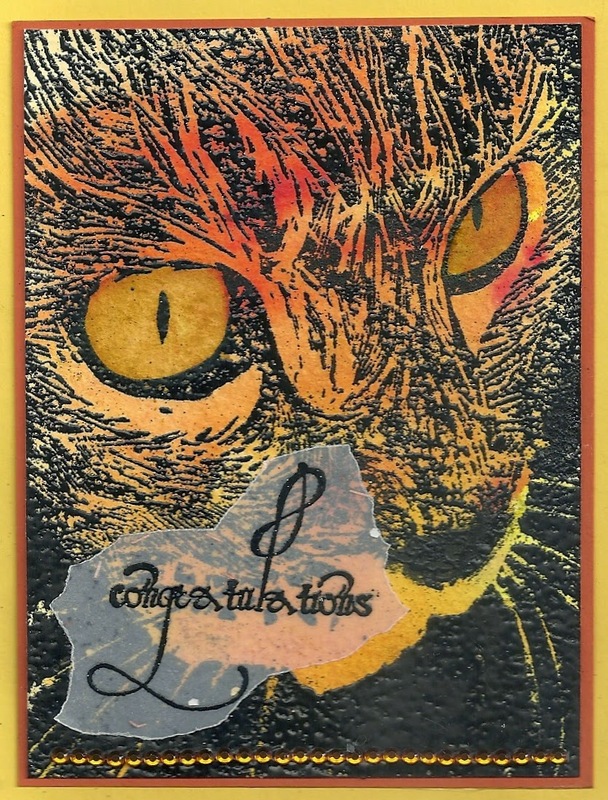 I used a variety of stencils and art mediums to create this one of a kind card. It was a work of love to honor my friend. It took me several hours to create it, but it was worth it. In the early afternoon, I used stencils to apply the textured embossing paste, the clear gesso, and the Crackle Paint. All of that had to dry very well before I could do anything else. Since I had to leave for several hours it was good. I can be impatient waiting for things to dry to begin work. I have also been sick for many weeks and unable to spend hours stamping. It felt wonderful to have the energy to do this and a few other cards as well. The Bible and flowers stamp is from Inkadinkadoo. The words are from Endless Creations. Due to our church's schedule of other events, the annual Mother's Day Brunch was held this morning. The ladies in charge of today's event did a great job, and Middle was surprised to see men there, because Daddy had told her that men weren't allowed, and that's why he and Poppa weren't going. I explained that the men in question had done all of the cooking for us ladies. "Men cook?" Middle asked, agog. That's really hilarious, especially when you consider the fact that Hubby cooks just as many meals as I do here. It's not like they don't see him cook. Three different door prizes had been donated by ladies affiliated with the church who also run their own direct-sales businesses. Everybody got three tickets to put in the drawings, and you could choose which drawings you wanted to enter. At the same time, Youngest was very perplexed on the other side of the table as she watched my mom write her name. "No," she said to my mom, "you have to write Daddy's Last Name." "But this is my last name," Mom said. "Yes, you got adopted. But I didn't. So my name is still the same." I don't think Youngest was very convinced, from what Mom said later. It was awful cute, though, that she thought Gramma and Poppa should now also have Daddy's Last Name. Good day fellow stampers. Don't you just love getting new stamps and new fun things to play with? I do for sure. So I am sharing a card made with a new stamp for Technique Junkie Stamps. And if you are a cat lover -- well, you will surely love this new stamp as well! This new stamp, called Kitty Profile, features the face of this lovely kitty. It is stamped on watercolor paper with black pigment ink and embossed with black detail embossing powder. But first I applied water first to the watercolor paper with a spray bottle. Then I added just swirls of water color paint through the water. That is how the various colors are achieved. I dried the paper with my heat gun before stamping and embossing. To color the eyes I used some Smooch paints and applied it the green with my aqua pen. Since it was painted over the yellows and oranges already on the paper, it gave the green a different look. I stamped congratulations on vellum and tore it a bit. I was able to put the vellum through my X Xyron sticker maker to allow it to be adhered to the background. A row of rhinestones, layering the focal image, and I was finished. Have a wonderful day! Get inky! Judge Krom was thrilled to be the judge for Adoption Day. She has been there almost from the beginning. One of her first comments was she was jealous because she doesn't get to go shopping for pretty little dresses for little girls! She was so happy for this family and so are Gramma and Poppa! We all celebrated with a lovely dinner out at TGI Friday. Every girl will have their own copy of the scrapbook, "Our Adoption Story." So will the parents and grandparents. Six books in all. In May of 2008, our son asked his sister and her hubby if they could watch and take care of his three very little girls (twins 18 months old and a not quite 3 year old big sister) for about six weeks - two months while he moved from a southern state back to our home area. Without going into the nitty gritty details of all of this, our daughter and hubby said sure. 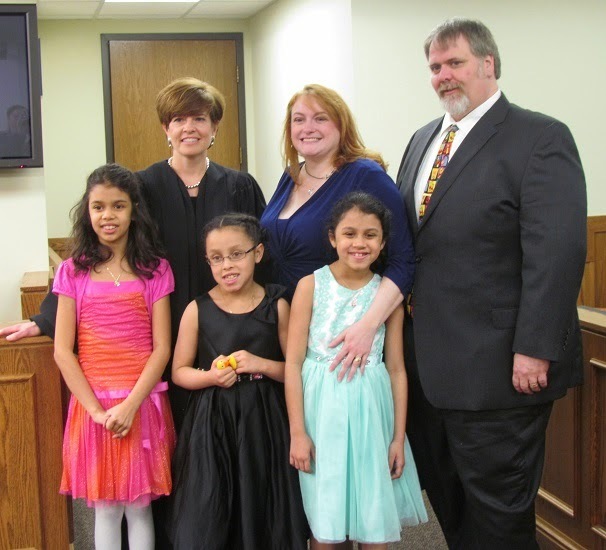 And today, our daughter and hubby officially adopt those three girls as their own children. There have been many ups and downs over the past seven years for every member of our family. There have been times of very real frustration, and times of very real joy. The full story is told by our daughter on her own blog, The Parenthood Experiment. The girls are very excited about this finally happening, so are our daughter and son-in-law, so is Gramma Bevvie (our son-in-law's Mom), and so are we! We will all be there! I created a scrapbook about their Adoption Story, and our daughter and I wrote all of the journaling telling the story of the "how" this adoption came to be. It is a story unlike most other adoption stories and it is unique. Our journaling focuses on the positive. The emphasis is on what is a family and how their adoptive family is unique. There will be a scrapbook for Mommy and Daddy, Gramma Bevvie, Gramma and Poppa Jackson, and one for each of the three girls. This is a very precious time and one we wanted recorded for their own family history. I saw this stamp from the company Stamping Bella. It is of only two little girls. But we have three granddaughters in this family. All three girls have wavy to very curly hair. I stamped the image twice, colored with my Copics, cut out one of the little girls, and then tucked her in and around the other girls. 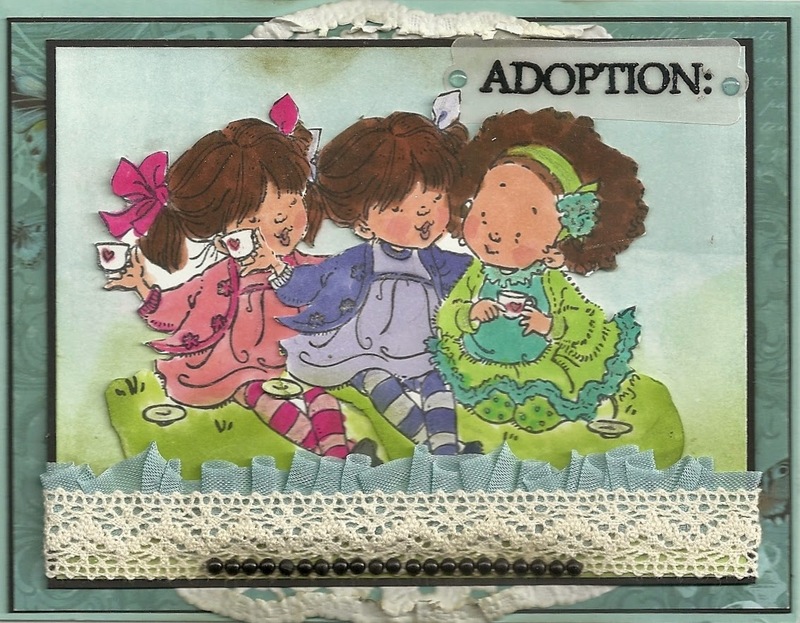 The word adoption and verses on the inside of the card all come from the set "The Gift of You" from Sweet and Sassy Stamps. Our family has been waiting for a long time for this day. We rejoice in God's providence and provision as we waited for this day to arrive. This day only makes legal and official what has been true for seven years. Our daughter and son-in-law had no idea in May 2008 that "adoption" was God's plan for them. 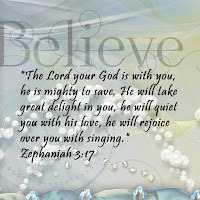 God knew what He was doing then, and we can trust that God knows the future now. And so we rejoice. 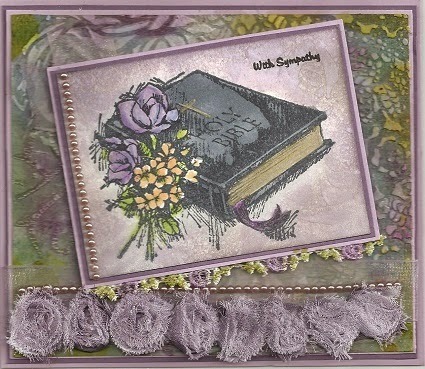 This is a throwback card - I made it in July 2009 with the Splatter Technique from the June 2009 issues of the Technique Junkie newsletter. 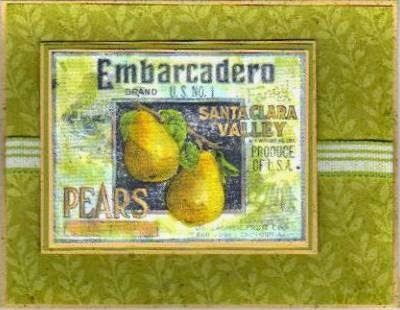 I remember making this card and remember how I enjoyed painting the pears. The stamp is from Stampsmith. Blog Hop on the Techjnique Junkie Design Junkies blog today! Today we are celebrating a new website, a new team, and a great discount! 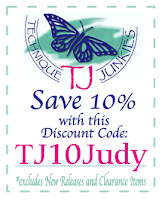 The NEW Technique Junkies website was launched today -- giving you one resource for stamps, tutorials and everything else you would expect from Technique Junkies. We have a ton of NEW stamps being released today, and our NEW Design Team has made unbelievable artwork with the images! Join us for today's hop - then go to www.techniquejunkies.com and check out the new site. To celebrate, we are giving you 15% off ALL stamps in the store! The above info is just a tease -- there is much more for you to see on the TJ DJ blog. Please go there now -- you will find the entire Blog Hop list of participating Design Junkies.